Bombardier is now looking into their light rail vehicles in Waterloo Region, after the TTC announced Wednesday its sending 67 of its new streetcars back for repairs. Bombardier has said 67 of the first 89 cars delivered need to have a welding defect fixed. They say the problem isn’t a safety risk, but it could cause the cars to fail early. The TTC will only send a few streetcars back at a time, and it’s expected to take four years to finish the process. Region of Waterloo communications coordinator TJ Flynn said in a statement that they are aware of the issue, noting that at this point Bombardier is examining the Region’s light rail vehicles to determine if a similar issue is present in the vehicles. He says that the region remains focused on ensuring that service will begin in December 2018, and on providing a quality and safe service to our passengers in Waterloo Region. 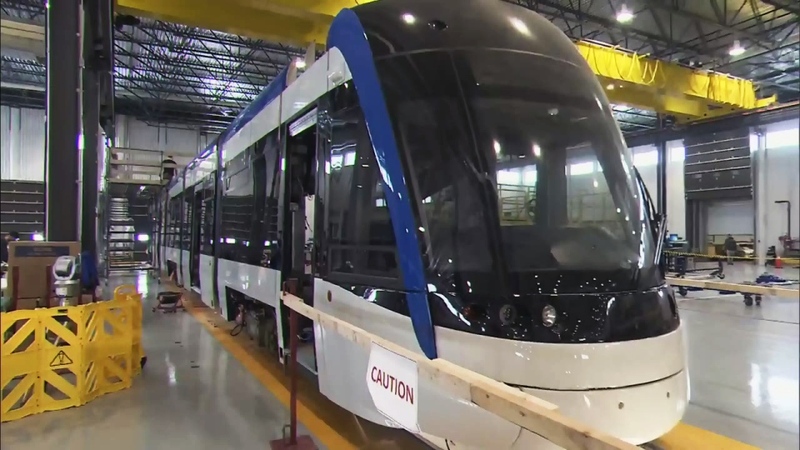 The second of 14 vehicles to be built for Waterloo Region's Ion LRT system is seen at the Bombardier plant in Kingston on Wednesday, March 15, 2017.